Banshee 1.5.1 is finally here! 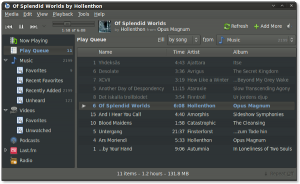 Banshee is an open source media player which is built using Gtk toolkit. 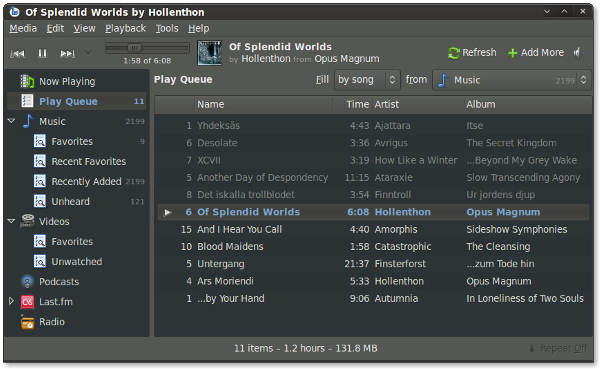 It is a good alternative to media playesrs like Rythmbox and Amarok. Banshee is available for both Linux and OS X.
Banshee 1.5.1 now has the option of shuffling by Artist or Album; so that you will listen to a new artist when every song by the current artist in the playlist has been played or every song in the current album. You can also make the shuffle biased and more likely to play higher rated songs or songs with new higher score. While this is in no way a revolutionary feature (read almost all the other major media players have it), it is still nice to see that it is now available in Banshee. Basically this feature fills your playlist with some random songs from your library and plays them in shufle mode so that it keeps playing endlessly.The playlist is randomly filled depending on artist, album, score or rating of the songs. One thing I think they have missed here is the option to fill the playlist based on genre, afterall you wouldn't want to hear a Britney Spears song just after listening to a Cradle Of Filth song. Other than the above two features some other features are also available like Keep Playing Song Visible, Support WebOS, Support Samsung Galaxy Android Phone and Ellipsized ListView Text. Banshee 1.5.1 also has a number of other improvements to already existing features and more than 130 bug fixes from earlier release. You can get more information about the new Banshee 1.5.1 from the official site.